Greg Sandoval/Business InsiderSheryl Sandberg, the chief operating officer of Facebook and a director at SurveyMonkey, plans to donate her shares in the latter to her charitable foundation. The parent of SurveyMonkey on Wednesday filed for an initial public offering. Sheryl Sandberg, Facebook’s chief operating officer who serves as a SurveyMonkey director, announced in the regulatory document that she plans to donate her shares in the online polling company to her charitable foundation. She owns about 10% of the company. Sandberg’s husband served as CEO of SurveyMonkey from 2009 until his death in 2015. Sheryl Sandberg won’t personally get any richer when SurveyMonkey, the company where her husband Dave Goldberg served as CEO before he died, goes public. 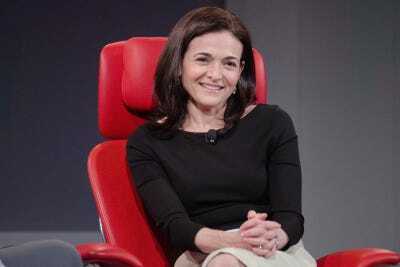 Although Sandberg owns about 10% of SVMK, SurveyMonkey’s parent company, she plans to donate all of her shares to her charitable foundation, SVMK said in the regulatory document it filed Wednesday announcing its planned initial public offering. Depending on how what price the company’s stock eventually trades at, that could be a considerable amount of money; she holds about 10.3 million shares. A representative for Sandberg, who serves on SVMK’s board and is Facebook’s chief operating officer, was not immediately available for comment. SurveyMonkey’s filing did not say when she plans to donate the shares, but it would presumably after its imminent debut on the public markets. Goldberg, Sandberg’s husband, took over the job as CEO from founder Ryan Finley, and held the position until his death in 2015. Sandberg joined the company’s board two months after his death. “SurveyMonkey embodies who Dave [Goldberg] was as a person-curious, helpful, approachable and at the same time powerful. Our strong company culture and business were shaped by his leadership,” writes SurveyMonkey in its IPO filing. The Sheryl Sandberg and Dave Goldberg Family Foundation has two primary initiatives – LeanIn.org, which promotes opportunities for women, and OptionB.org, which provides programs that try to encourage resilience in the face of various tragedies and challenges, including sexual abuse and the loss of loved ones. Sandberg’s donation to the organisation is part of her commitment to the Giving Pledge, a movement by affluent individuals to donate the majority their wealth to charity.